This is my first edited Blogger Template from new "flexible" Blogger Template code. Actually, I lil bit complicated because it's a long time no tweak any blogger template xml code especially this new one. Floral Photoblog Template, I name it. Yes, this template has full width with no sidebar. You can put your widget on footer. This is because of its purpose special for photography blog, photoblog, or any art and picture blog. This template use new Blogger Template code so you can make any changes through Template Designer menu. If you don't like its background, color, font, or anything, you can edit it simply from Template Designer. You also can choose 1,2,3, even 4 columns in case you want some redesigning. Also use your own blog logo as your blog brand. Create and upload it directly via Page Elements. You also can change favicon and navbar setting. It's really customizable. Share your favorite moments, beautiful and memorable photos with your reader and use this Floral Photo blog theme/template. 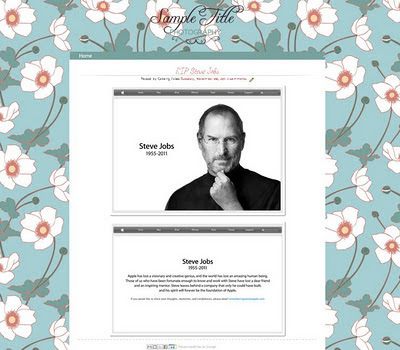 I think template was design and inspired by Steve jobs. template was cool hope you share a link for free downloads..
Photoblog is the best photoblogging service in the world. fantastic points altogether, you simply won a logo new reader. What could you suggest in regards to your submit that you simply made some days in the past? Any sure? I feel strongly about it and love learning more on this subject. I love the colors and the doodles! If at all possible, while you gain knowledge, would you mind upgrading your site with more information? It is very helpful for me. Thank you for taking the time to go over this. Mostly people are very like it and more fantastic post shared on the site so that can be know that and enjoy it in this post. Often people are more enjoy it. Floral photo blog so nice and more interesting blog so that can be enjoy it and mostly people are very like it. Mostly people are very like photo blog template the grateful and more interesting post shared on the site that can be enjoy it. Nice and more fantastic photo blog template shared on the site so that can be know that and able to understand in this blog. Mostly are very like it and enjoy it in this blog. The grateful blog shared on the site. Really great blog site and fabulous job you are doing. Keep up with your good work..
Buy the best quality fight club leather jacket from celebswear.com . Made with the best quality material to ensure you to provide the quality product at a very reasonable price. i like this :) thanks for sharing . very nice and clean template. Love the design, simple yet attractive. Nice job admin. woow,,,its beautifull template,,, i like it,,,! HOW TO ADD REPLY COMMENT ON THIS TEMPLATE?